The intermediate surf package is a good option for the surfers who surfed before. Our experienced local surf guides will drive you to the best surf spots adapted to your level. for the first day of surfing with us please expect that our instructors will drive you to surf the easy small waves to test your surfing level. this is of course for the sake of your safely. 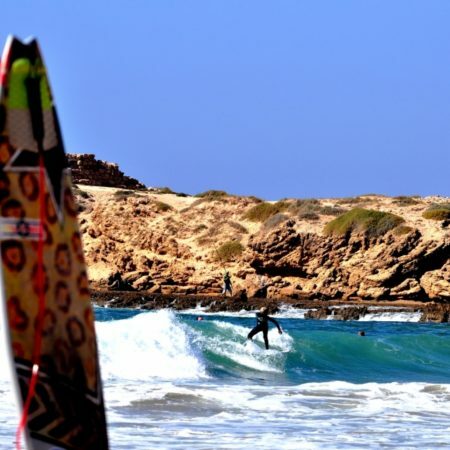 Morocco coastline near Taghazout bay has more than 30 surf sports that provides intermediate surfers with the perfect conditions and space to progress. The Intermediate Surf Package is all about finding the right conditions to improve your skills and to enhance your experience of riding unbroken waves. An intermediate rider is a surfer who can successfully paddle out alone at a familiar location and catch and ride waves to a logical finish frontside or backside, confidently using the three basic surfing turns – bottom turn, top turn and cutback. Once you’re ready, they will take you into the waves and start guiding you into your first rides. All you need to be able to do to start surfing is swim 20-30 meters. You first learn in very small waves in the white water so you get familiar with the waves and you get started safely. We work with the very best local surf instructors to ensure that you have a safe and fun introduction to this amazing great sport. we make surf sessions photos and when back to surf house we show you the photo or video feedback and give tuition to progress to have a fun surfing holidays. Please note: all prices are per person. Single room supplement +20€ per night for Standard shared shower room +30€ per night for Upgraded private Bathroom * One social night out dinner is not included. In the Surf packages Includes: surf equipment, 2/3 hour surf lesson + supervision afternoon surf session for beginner surf lesson Package or full day of surf guiding, surf transport to surf spot of a day for Intermediates and Advanced surf packages, pick up lunch (sandwich or salad with fruit, biscuits),bottle of water, vegetarian food available. Please note: that surf lessons are not included in this package. 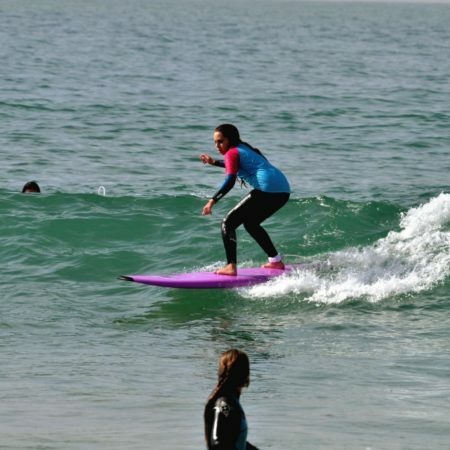 If you are not sure whether intermediate surfing package is appropriate for you, please book a Beginner Surf Lesson Package. Please note: A Free Return Agadir airport transfers are included in the night 7th + packages. A FREE arrival transfer is included in night 5th + packages. if you book less than 5 nights and you want us to organise a transfer. Agadir Airport transfers cost €28/300mad per way. Agadir Bus Station transfers cost €14/150mad per way.